A western Caribbean cruise that includes a stop in Belize will surely offer different experiences than Cozumel, Jamaica or other islands. People don’t go to Belize for the beaches, although this Central American country has them. Instead, they often go for history, culture and adventure. Any visitor with a sense of history and culture will want to visit the many Mayan ruins. Anyone with a sense of adventure should try this country’s unique excursion and one of our favorite travel tips -- cave tubing. It is one of the best excursions in the Caribbean region. 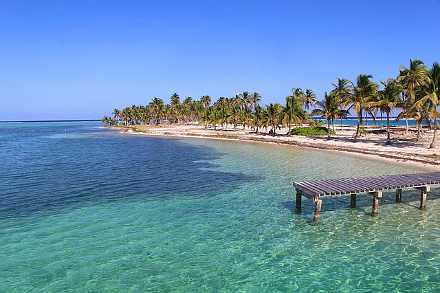 Belize is the 13th most popular Caribbean tourism destination, according to the Caribbean Tourism Organization. Nearly three times as many people visit this Central American country via cruise than by a stopover because it is one of the most popular western Caribbean cruise ports. It also is close to Cozumel, which is the top western port. Cave Tubing -- Relaxing yet adventurous is how some tourists might sum up their cave tubing experience. Cave tubing is fast becoming the number one tourist attraction for this exotic country. For 1 1/2 hours, visitors float leisurely on large inner tubes in water the color of sun-ripened limes. The river takes them underground through cool dark caves on the Sibun River Cave Branch. They take in the beauty of the caves and learn how ancient Mayans used the caves for spiritual purposes. Mayan footprints, 1,000-year-old pottery shards, underground waterfalls, stalagmites and stalactites are all part of this relaxing, yet eerie adventure. Mayan Ruins -- Listen. If visitors are quiet, they can almost hear the rhythmic beating of the drums of this ancient civilization. The Mayan ruins of Altun Hun, Caracol, and Xunantunich become the history buff's playground. Tourists stroll through excavated ruins, pyramids, temples and ceremonial centers rich in the history of this intriguing country. The Blue Hole -- Experience diving like never before. The Blue Hole is in the center of Lighthouse Reef. This reef is an atoll that forms an almost-perfect circle 1,000 feet wide and 412 feet deep -- so large it can see it from space. Divers can view stalactites three-feet in diameter that were once part of the an old cave's ceiling. Experienced instructors take divers to depths of 140 feet where they experience the stark beauty of the Blue Hole. Little marine life is around at that depth, unlike usual diving experiences, where the beauty comes from colorful and exotic marine life. While cave tubing, the Mayan ruins and the Blue Hole are exciting, Belize isn’t strictly for thrill seekers. Vacations in Belize also offer traditional attractions. Visitors will find nature trails for hiking. Sailing and fishing are also popular tourist activities as well as birding. Belize is home to over 600 species of birds that migrate to Belize or live there year round. The barrier reef is 185 miles long. Islands lie between the reef and the mainland, creating numerous opportunities for watersports, especially diving and snorkeling. U.S. and Canadian citizens require a passport if they are stopover visitors. Cruise visitors need their ship ID to exit and re-enter the ship. March is the most popular month followed by December and February. The least popular months are October and then September, the CTO says. They are the two worst months of the Caribbean hurricane season. The average high temperature in Belize City ranges from the low 80s Fahrenheit in the winter to the upper 80s in the summer, according to the Belize National Meteorological Service. The dry season is brief. It begins in January and ends in April with an average rainfall of about two to three inches a month. December and May are transitional months between the dry and rainy seasons with about four inches of rain each month. The rainy season begins with 10 inches in June and continues through December. Cruise ships mostly visit the country during the dry season. Far fewer visit the rest of the year. Both rainfall and temperatures vary more widely throughout the year than the typical Caribbean island. The climate is tropical, very hot and humid. Currency is the Belizean dollar, but U.S. currency and major credit cards are widely accepted. Tipping ranges between 10 and 15 percent for hotels, restaurants and tour guides. The hotel room tax is 9 percent. Spanish and Creole are the dominant language, while English is the official language because of the country's history as a Spanish and then English territory. Tourism is the dominant economic sector. Geography ranges widely from plains to savannas to tropical rain forests.